A good starting location is Eidsbugarden. From Oslo or Bergen, take Hwy. E-16 towards the main mountain crossing that is about half-way between Bergen and Oslo. Locate the intersection named "Tyinkrysset", where a road heads north (also uphill) towards the large lake Tyin. Take this road, after driving 3.8 kilometer, you approach the lake and also a side road (good dirt) that forks right. (The main road continues to Årdal.) There are signs for Tyinholmen and Eidsbugarden. Drive this road about 18.8 kilometer. You are now at Eidsbugarden. There is a large, pay parking area on your right. The cost in NOK 50.- for 24 hours (2008). Park here, this is the trailhead, location N61:22.475, E008:17.832, elevation about 1060 meter. There are two main routes. I will describe both below. The "easiest" route is YDS class 2+, the "best" route is YDS class 3. This is an excellent example where the objectively safest route is slightly harder in a technical sense. North West ridge: This route is (YDS) class 3. 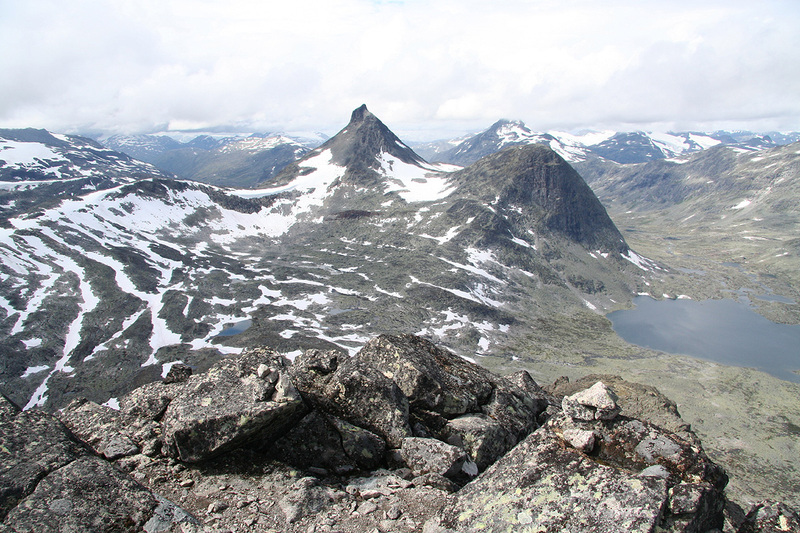 When coming from Olavsbu, take the trail (towards Eidsbugarden) to the saddle between Olavsbunuten (1970m) and Snøholstinden. When coming from Eidsbugarden, one may ascend to the ridge as soon as you have reached the north end of lake 1488. Proceed uphill along the top line of the ridge, the ridge is broad and easy to walk to about 1850 meter. Above you is a broken, stand-alone rock structure. Continue uphill on the right side of this rock. A gully runs further uphill, however, easy scrambling is better on the right side of this gully. 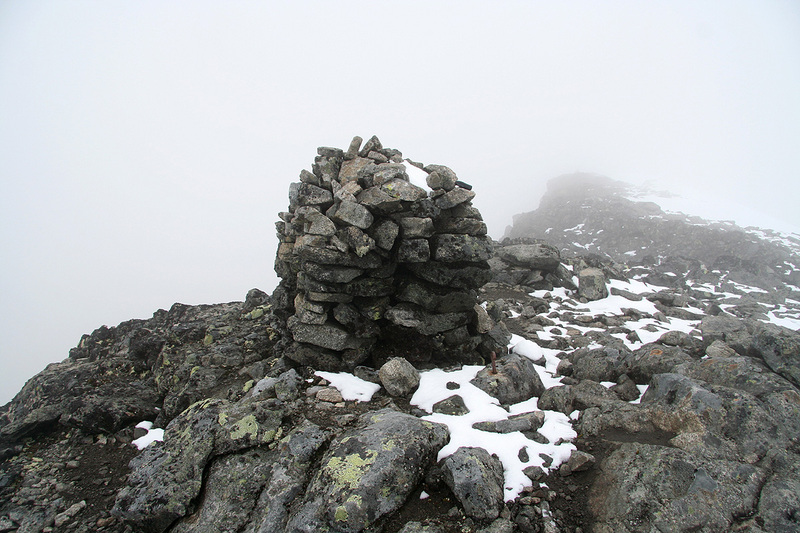 There are a few small cairns showing a good route higher. Above, you gain a fairly broad and level area before a much more distinct and narrow ridge rises above you. Continue directly towards this ridge and climb the initial slab from your right hand side. Follow the very top and gain a small notch with a cairn higher up on the left side. At this point it looks tempting to traverse out on the east face, this is wrong! Turn right in the small notch and climb directly up to regain the top ridge. Continue uphill along the very top until you arrive at an almost flat section. The ridge ahead looks broad and easy, however, you are not done yet. Higher up, you see a new section of the summit ridge. The slope is gentle, but the ridge is much sharper. The climbing is not difficult and higher up you arrive at a steeper block that requires climbing. However, this block may be bypassed on the left (east) side, immediately beyond one can regain the main ridge near a small dip in the ridge behind this obstacle. 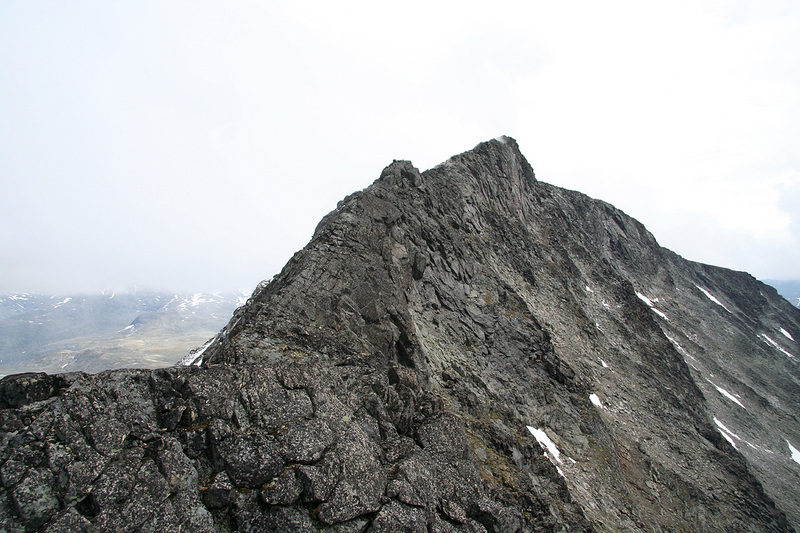 From here, the ridge is easy as it continues a gradual climb to a small summit point marked with a cairn. The main cairn is a bit further along a flat and increasingly wide summit plateau. The scramble part of this route is on good rock with many good holds for hands and feet. If you find yourself in (YDS) class 4 terrain, you are off-route. Backtrack and find the proper route. There are several points with (considerable) exposure, but the entire route is an excellent scramble that can be highly recommended. This route is far better than the south ridge route described below. In particular, this applies with respect to the danger of loose rocks on the south route. South ridge: This route is (YDS) class 2+. When coming on the trail from Eidsbugarden to Olavsbu, as you descend west of the mountain, leave the trail and head across the narrow passage between lake 1488 and lake 1486 (Snøholvatnet). Climb directly uphill to about 1700 meter, then traverse right (south) while climbing gradually to 1900 meter. You will gain a level plateau just inside a small hump on the south ridge. From here, climb directly north up a steeper section that tops out at 2020 meter. The slope may be slightly less steep if you stay on the right (east) side. This slope requires no climbing, but it is full of loose rocks and steep enough to have them shoot downhill when touched or moved. Thus, extreme care should be taken if there are more climbers on this slope. In fact, the only reasonable behavior is to move together in a single group. 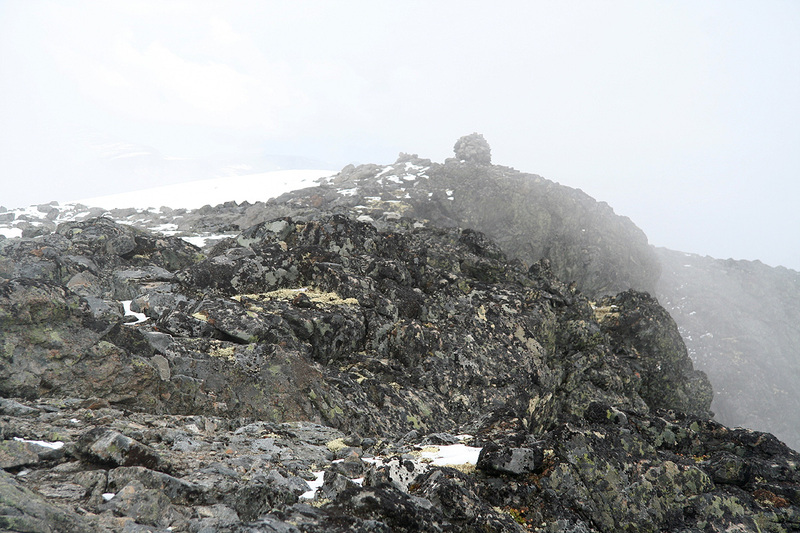 From 2020 meter, the ridge is broad and very gentle to the summit cairn. This route is also very unpleasant when wet (rain or a thin layer of new snow). 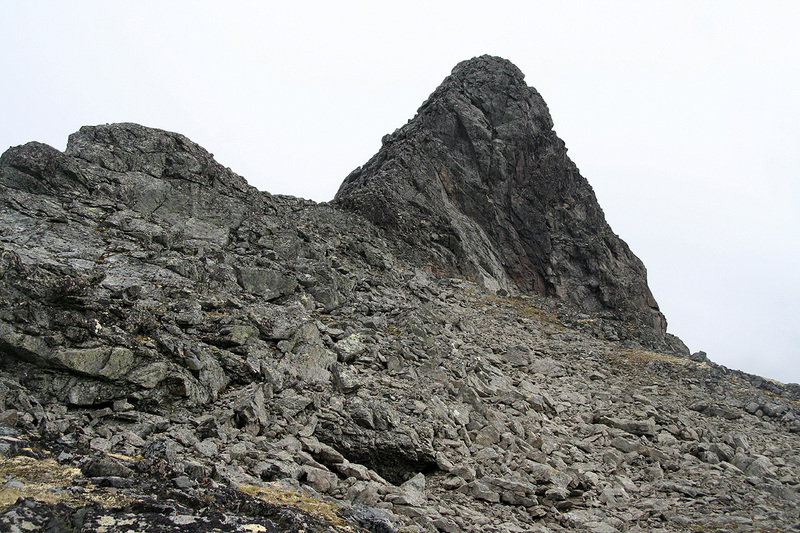 The route described above (north-west ridge) is objectively a safer route despite its slightly more technical nature. The day was scheduled to be a day of transportation. I needed to drive from my mountain cabin near Lillehammer and back home to Bergen. The weather was not great, mostly overcast, but substantial rain was not in the forecast. I decided to drive up the Valdres valley and consider a stop and some hiking if things worked out ok. As I came to Vang, I considered the 1582 meter Gilafjellet, but decided that it was better left for a winter ski trip. Then the idea of hiking Snøholstinden suddenly formed. 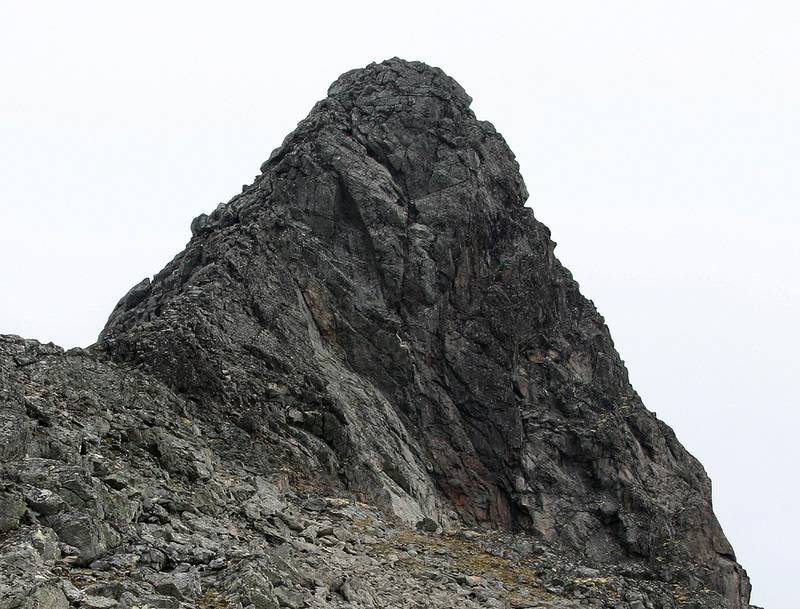 I believed that this mountain was not too far from Eidsbugarden, more or less on my route to Bergen. I drove to Eidsbugarden and parked. I was really ill-prepared in the sense of not having a single clue about how one might go about climbing this peak, no information about routes and level of difficulty whatsoever. I decided to carry along crampons and my ice axe as well as a couple of slings. I believed that the shortest hike would be along the trail to the DNT hut Olavsbu. I started out at 1015 and figured that I had plenty of time to do this hike, then drive to Bergen. However, as I walked along the lake Store Mjølkedalsvatnet, I started to realize that this approach hike was quite substantial. 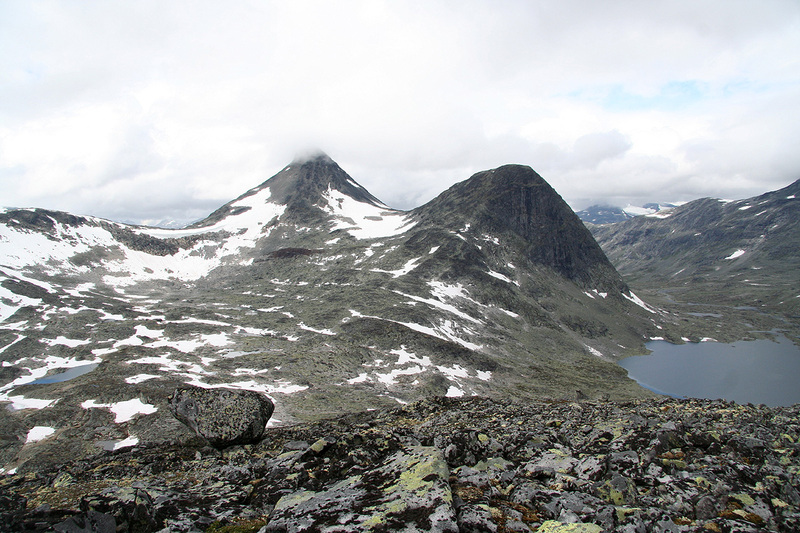 As I crossed the col north of Høgbrøthøgde (1821m), Snøholstinden finally came into view. Boy, it looked pretty steep on all sides. I sat down and rested while considering my options. The ridge from the north (properly north-west) looked reasonable, but had a few steep sections. I had no idea how wide it might be, possibly with bypass options on the far side? The slope coming down towards the south also looked feasible. I decided to follow the Olavsbu trail about one kilometer north of lake 1488, then make an attempt to ascend the entire north-west ridge. 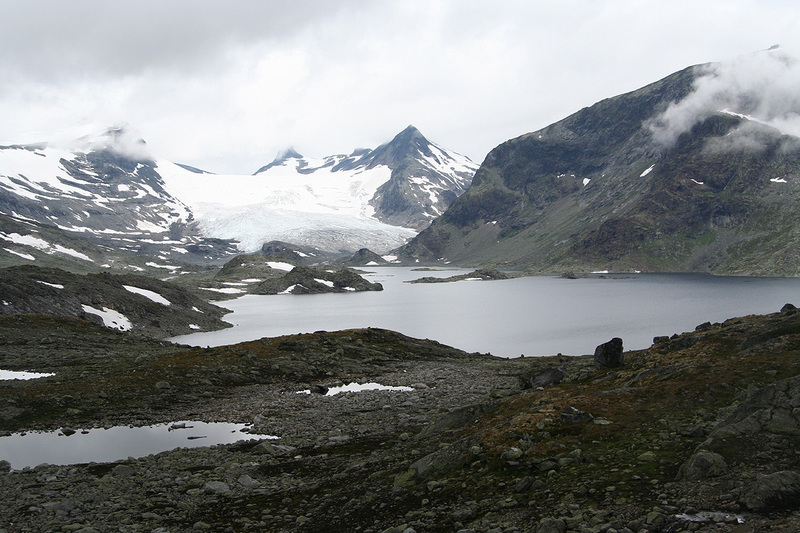 It made sense to consider a traverse and then descend south directly to the crossing between lake 1488 and lake 1486 (Snøholsvatnet). I arrived at the base of the ridge about 3.5 hours after starting out. A simple estimate now told me to add another 3 hours for the return hike, then perhaps 4 hours for the peak (it did indeed not look straightforward), more than 10 hours. My plans for reaching Bergen reasonably early needed radical adjustments! I ascended the ridge and made a brief stop slightly above 1800 meter. I had spent 4 hours and the ridge above looked intimidating to say it the least. 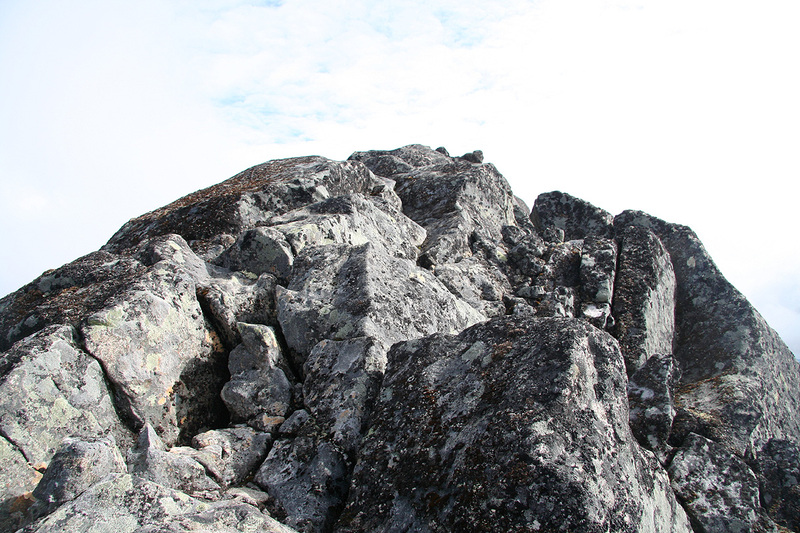 The ridge was indeed narrow, climbing on the east side did not look like an option. A couple of steeper sections might prove impossible given my solo hike in not so nice weather. My crampons and ice axe looked like excess baggage, I could not see any ice or snow on the mountain. Still, this project captured my full attention. The problems higher up might just get sorted out along the way. Mountains sometimes look harder than they are from a view point like this. I proceeded with caution, an extra sense of exploring since I had no information about this route, added to my already very good feeling of being in this interesting landscape. I realized fully that I possibly would have to turn back, that the south ridge would have been a "safer" route to gain the summit. However, this looked an awful lot more interesting. The first section of scramble got me up a "mini-ridge" just right of a gully. There were small cairns in a few places, so at least there was a route up this way. How difficult remained to be seen. The next section of ridge looked like the hardest part. I came upon a small cairn in a notch on the left and what looked like a clear route continued out into the east side. I proceeded that way trying to gradually regain the ridge above, but ran into difficult terrain. The slope was steep and dangerous below. 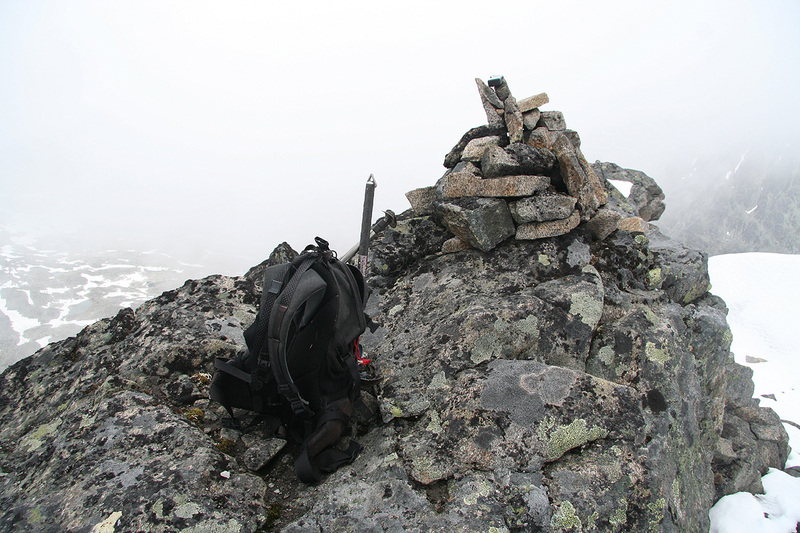 No more cairns, I carefully climbed back down and returned to the last cairn. A closer look revealed a route directly up to the top ridge, a lot easier and soon I topped out on a more level section. The ridge ahead looked really easy. However, this gave a false impression, I soon saw a rather long continuation of the ridge, pretty flat, but sharper than ever. The continued scramble was pure fun and the last major obstacle was easily turned on the left side. The top section of the mountain had received new snow, but in moderate quantities. I arrived at the summit cairn at 1520, slightly more than 5 hours. Unfortunately, the clouds converged on me just as I arrived and the views around vanished in the fog. On top of this, the first non-trivial rain started. I had decided to explore the south ridge for my descent. This involved easy hiking down to 2020 meter, but looking down from there, the terrain was rather steep for the next 100 vertical meter. No difficulties beyond an insanely slippery surface with lots of loose rocks. I touched several and they immediately zipped down the slope at high speeds. I was happy to be alone, any climber above me would have been a major hazard. The descent took time as everything was slippery. The rocks, the moss, the lichen covering many rocks, all contributed to very nasty conditions. I know only one recipe, slow and careful. Finally, I was down by the lakes, the descent had taken me almost 2 hours. The return hike was long and uneventful. Rain showers and not a single person. I felt the lack of food and overall effort and was quite tired when reaching the car at 2030. Slightly more than 10 hours, my arrival in Bergen would be after midnight. After many mountains abroad, this was an excellent hike to conclude the summer and remind me of all the quality mountains we do have in Norway. Mjølkedalsbreen glacier, as seen from the trail. Snøholstinden, as seen from the west. The second step, the first scramble is behind, the second section looms ahead. 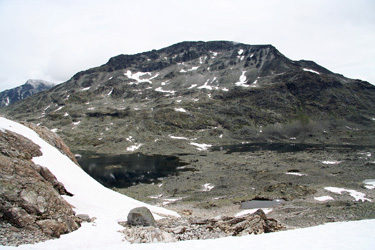 View north to Mjølkedalstinden (2138m). The picture is taken from the ridge at the point where you top out from the steeper part.